What Do You Know About Dog Training? A well trained dog can amaze a crowd and impress your friends but the main focus on dog training and obedience school is to have a well behaved pup as well as a protector. A few months ago we met a new client that specializes in several types of dog training. Located here in Phoenix, Desert Sky K9 All Breed Dog Training has all of the knowledge needed to teach your furry friends right from wrong and of course how to do tricks. With over 20 years of experience in family pet training and working K9 training, Mark and Gail are sure to provide an effective and useful learning experience. 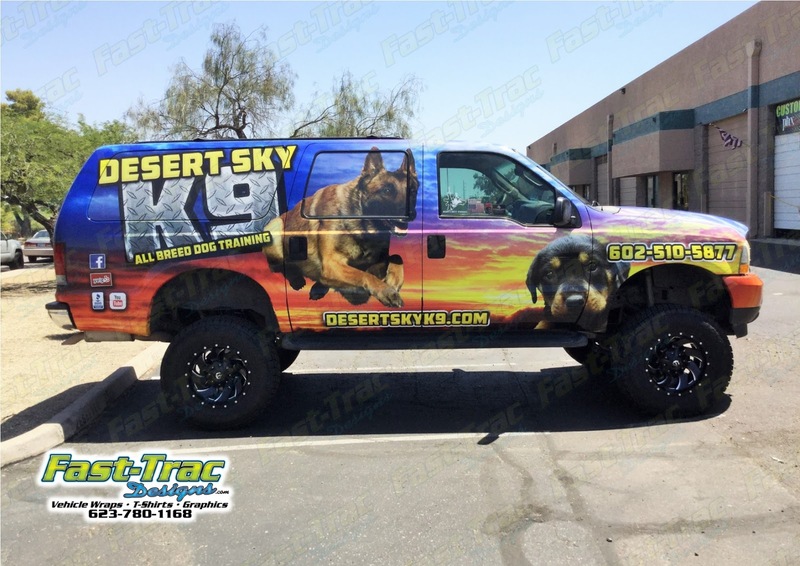 We hope hundreds of potential customers for Desert K9 see there full custom vehicle wrap that was designed, printed and installed here at Fast-Trac Designs. Since they do specialize in training the Malinois breed our design team was sure to incorporate that photo into the wrap design and a gorgeous photo of an Arizona sky. Another service we provided to Desert Sky K9 is custom printed T-Shirts featuring their logo with diamond plate texture. We were very excited to see them on a news special showing off their new apparel and well trained pup. Here at Fast-Trac Designs we enjoy seeing our clients succeed. We had a great time working with Desert Sky K9 and look forward to their next project.